16/365 – “Myself” nr.16, a photo by Luca Rossini on Flickr. This is my bedside table. Going to sleep is, when my daughter Agata allows it, the last thing I do each and every day. I love sleeping, I used to need at least eight hours of good sleep to properly work, then Agata taught me that number was way overestimated, and forced me to reduce it to six. Not even continuative. And now I even hate to have to go to sleep. Those few hours between putting Agata to bed and going to bed myself are the only ones in which Claudia and I are “alone” again, as we used to be for the last ten years. Those two-three hours are the sole remains of what our life used to be. However, sooner or later the sleepiness eventually wins the battle, and we are forced to drag ourselves to bed. 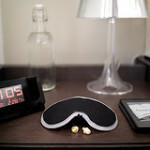 When that happens, the presence of these items on my bedside table make a good sleep possible. So, this is my bedside table. What does it tell about me? Well, if you look at the big picture, instead that at each and every item separately, you’ll see how I hate to interrupt my sleep. Should I wake up wandering what time it is, I just have to slightly open my eyes, since the alarm-clock projects the time directly on the ceiling; should I wake up feeling thirsty, I just have to stretch my arm and grab the water bottle; should there be any noise (like a party) waking or keeping me up, the ear plugs are just there, as the eyeshades. Plus, I like to read before sleeping, and my kindle is just there. Without my bedside I would be sleepless. And for as trained as I can be to sleep deprivation, my creativity and productivity still depend a lot on the quality of my nights. 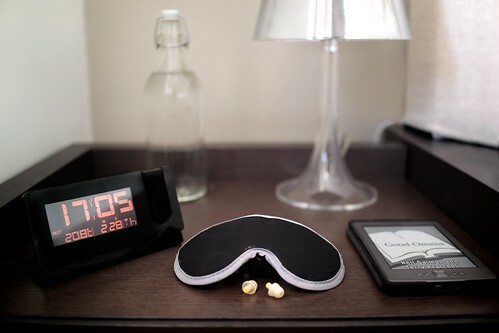 This is why, no matter where I am, at home, in a hotel, at some friends’, I never go to bed if I don’t have a good measure of water on my bedside, together with the eyeshades, earplugs, and an easy-to-reach-and-watch alarm. I may not need any of them during the night, but should I, they’ll be there for me, preventing my sleep to fade away.